I’ve not got far into this book, but I know it’s a keeper. Here’s the Amazon link – it’s called “A Street Cat Named Bob And How He Saved My Life” by James Bowen. While watching TV last night, I was sketching faces in front of me the whole time. (It’s a great way to practice, if you’re into faces.) Time for bed, and I happened to see this book cover…and I just had to do a quick preliminary sketch, to see if I could capture their essence. For a quick sketch, I was happy with it. 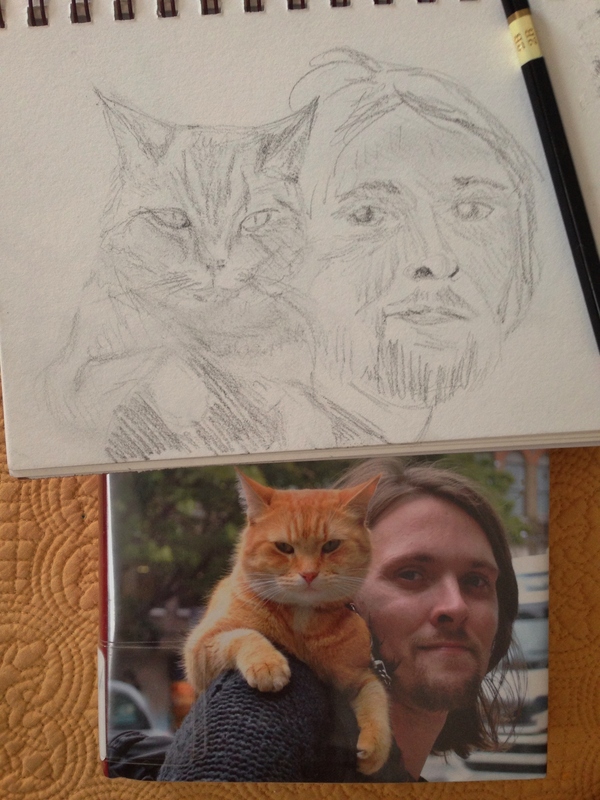 I’m happier with the man’s face than the cat’s, but I’d like to revisit this image and try and do it some justice. Don’t they look like a wonderful pair? Apparently, the man was a heroin addict, and this cat wouldn’t leave him alone. He wound up turning the man’s life around. I just love stories like that! Thanks, Rebecca! I’ve never actually owned one, but this story is making me wonder if maybe I should. :))) Glad you enjoyed it too! Am in the snow zone. I had what you have now on Monday evening and on Tuesday morning had to be dug out of my apartment as my door was blocked from snow falling off the roof. It is unreal and you have my best wishes for your safety. (((Warm hugs))). What a great sketch made even sweeter by the story!!! How much snow did you get Laura? Lol about 18″ so far and supposed to snow til 5-6pm! I’m totally blown away, didn’t expect it to be so deep this early in the morning. Glad you enjoyed my sketch, Jodi, and I’m really glad you escaped most of this in Mars! Well stay safe and warm and draw away! Lots of inspiration!! Hugs! You are an avid drawer. So good that you steal moments to draw. A good sketch. Isn’t drawing from TV fun. Some of the British shows have great closeups of faces. Another good choice the old shows in black and white – Perry Mason is one. You are drawing in values with black and white shows. That’s a great idea Carmel, thanks! I do a lot of Doc Martin sketches and even some from Downton Abbey. Lots of interesting faces on both of those shows. Stay warm and safe. Don’t drive anywhere!! We do not get the snow.We have endless days of rain. Day 23 today! I can’t imagine that! Although I kinda like the rain. It’s hot and humid weather I really detest lol. I like a little snowstorm, but this is ridiculous. We live at the end of a dead end road and who knows how many days before we’d be able to drive. Thankfully we stocked up on everything before hand. Glad you enjoyed the sketch. Aw, what a nice story – cats are the best! Your sketch is very cute! And ski mask and gloves? I think this calls for a self-portrait 😉 I hope the blizzard isn’t causing you too much hassle… send a dusting of the stuff over to the UK if you like! I’d love to send it somewhere, but not to anyone who’d have to dig out from it lol. Thanks, Jacob, glad you enjoyed it! I like the TV idea. An endless array of new faces…And I love the sketch and the story. We have about 14″ so far at 10:30 AM. So windy and stormy! It’s exhilarating. I’m so glad someone’s enjoying it, Claudia! We’ve got 23″ at last measure and it’s a lot of work, even with a snowblower. Glad you enjoyed the sketch. Stay safe and warm! You can see the connection in the drawing already. Amen. We’ve already started. I can’t believe how much snow is out there, and still falling. Were you supposed to get so much?! They kept changing the predictions…3″…18″…it’s over 2 feet, the largest single snowfall I’ve ever seen here for sure. Nicely done! I love that you included the photograph with your sketch. Have been checking in with our family in Maryland…whew…you guys are getting hit! You’re not kidding Kathy. I’m glad you’re in Georgia! I like a little snow but when they start predicting in feet, I’m wanting to fly south lol. Glad you enjoyed the sketch. Did you get any snow? Just a dusting…I was out in it all day taking pictures though! Laura, your sketch has established the overall proportion of the subjects. You’re doing great my friend. Keep on sketching. Keep on drawing my friend. Connie, you’re so kind! Thank you so much! Thanks, Charlie! It was just a quick one before bed, but I thought it turned out well enough to share. I’m really glad you enjoyed it. Nothing like the love of an animal. ❤ Give your Phineas big hugs from his Auntie Laura. Thanks Fabio! I really appreciate your comment. Take care and have a great weekend with your lovely family. Thanks Donna! So glad you enjoyed it! Laura, I agree you did a lovely job of “capturing their essence”. A wonderful pair. Thanks so much, Wendy! I really appreciate you stopping by! Wonderful sketch! But then, cats are perfect subjects ☺ greetings from Poland! Thank you so kindly! I love cats very much, but drawing them is challenging. Fun, though. So glad you enjoyed it! Beautiful post, love the drawing and ending to the story! Thanks so much! I was looking at your lovely cat photos and thinking of drawing one…. Thanks for the follow!